Zanaflex, Soma and Flexeril are commonly used muscle relaxans medications and provide a relief of discomfort associated with acute, painful musculoskeletal conditions in adults, such as muscle spasms, cerebral spasticity, etc. This post features a detailed comparison of the three drugs. Medical uses, side effects, mechanism of action, dosing information, contraindications and precautions of the active ingredients of these drugs (e.g. Tizanidine, Carisoprodol and Cyclobenzaprine Hcl) are compared. Zanaflex is a muscle relaxant medicine. It is primarily used to treat muscle spasticity (1, 2). Chief component of Zanaflex is tizanidine, an alpha 2- adrenergic agonist (3). It is used to treat muscle spasticity. Spasticity is a medical condition in which some muscles of body are continuously contracted. This constant contraction causes stiffness or tightness of the muscle. It interferes with normal movement, speech and gait of patient. This is usually caused by impairment of the portion of the brain or spinal cord that controls voluntary movement. The damage alters the balance of signals between the nervous system and the muscles (4, 5). Zanaflex is not helpful in curing aforementioned diseases but proves useful in physical therapy by decreasing muscle spasticity. Gastrointestinal adverse effects include dry mouth, constipation and vomiting. Elevated levels of liver function tests are observed in patients on Zanaflex therapy. It is rapidly resolved upon removal of medication. Visual hallucinations have been observed in many cases. Sedation is produced upon intake of large doses. Nervous system adverse effects are commonly associated with this drug. Sedation, somnolence, dizziness and asthenia have been reported in patients. Tizanidine is an α2-adrenergic agonist that is capable of producing low blood pressure. Syncope has been reported in some patients. The chance of significant hypotension may possibly be minimized by careful calculation and titration of the dose and by remaining on alert for signs and symptoms of hypotension prior to increasing dosage. Furthermore, patients moving from a supine to fixed upright position are at higher risk for hypotension and orthostatic adverse effects. Observe keenly for signs of hypotension when Zanaflex isused in patients receiving concomitant antihypertensive therapy. It is not advisable that Zanaflex be used with other α2- adrenergic agonists. Clinically significant hypotension (decreases in both systolic and diastolic pressure) has been reported with simultaneous therapy of either fluvoxamine or ciprofloxacin and single doses of 4 mg of Zanaflex. Therefore, combined use of Zanaflex with fluvoxamine or with ciprofloxacin, potent inhibitors of CYP1A2, is not advised (8). Zanaflex may cause injury to liver cells. Zanaflex should be used with care in patients with any degree of liver disease or impairment. Recording of aminotransferase levels is suggested for baseline and 1 month after maximum dose is achieved, or if hepatic damage is suspected. According to the makers, about 5% of patients under tizanidine therapy in clinical studies had increase in serum transaminases greater than 3 times the upper limit of normal (or 2 times if baseline levels were elevated), compared to 0.4% in control patients. Most cases did not exhibit any signs or symptoms and resolved speedily after withdrawal of the drug. However, liver injury resulting in fatal consequences has been reported in post marketing use. All patients undergoing tizanidine therapy should have liver function tests performed at baseline, 1, 3 and 6 months, and at regular intervals thereafter. They should also be instructed to report without delay any signs and symptoms of hepatic impairment such as fever, rash, anorexia, nausea, vomiting, fatigue, right upper abdominal pain, dark urine and jaundice. Zanaflex should be used with care in patients with renal disease (creatinine clearance < 25 mL/min), as clearance is decreased by more than 50%. In these patients, during titration, the individual doses should be brought down. If higher doses are vital, individual doses rather than dosing frequency should be raised. These patients should be observed vigilantly for the onset or increase in severity of the common adverse events (dry mouth, somnolence, asthenia and dizziness) as indicators of possible overdose. Zanaflex is to a large extent excreted by the kidney, and the risk of adverse reactions to this drug may be higher in patients with impaired renal function. Because elderly patients are more likely to have impaired renal function, caution should be practiced in dose selection, and it may be useful to monitor renal function. Zanaflex may be a perpetrator of sedation, which may interfere with everyday activity. In the multiple dose studies, the occurrence of patients with sedation peaked following the first week of titration and then remained stable for the duration of where dose was maintained. The central nervous system depressant effects of Zanaflex with alcohol and other central nervous system depressants such as benzodiazepines, opioids, tricyclic antidepressants may be additive. Carefully observe and monitor patients who take Zanaflex with another central nervous system depressants for symptoms of excess sedation (9). Zanaflex use has been linked with hallucinations. Formed, visual hallucinations or delusions have been reported in many controlled clinical studies. Majority of the patients were aware that the events were unreal. One patient developed psychosis in tandem with the hallucinations. One patient among these 5 continued to have problems for at least 2 weeks after discontinuation of medication. Opt for discontinuing Zanaflex in patients who develop hallucinations. Because of possible drug interactions, Zanaflex is contraindicated in patients taking powerful CYP1A2 inhibitors, such as fluvoxamine or ciprofloxacin. Harmful reactions such as low blood pressure, bradycardia, or excessive sedation can occur when Zanaflex is taken with other CYP1A2 inhibitors, such as zileuton, fluoroquinolones other than ciprofloxacin (which is contraindicated), antiarrythmics such as amiodarone, mexiletine, propafenone), cimetidine, famotidine, oral contraceptives, acyclovir, and ticlopidine. Simultaneous use should be avoided unless the requirement for Zanaflex therapy is clinically vital. In such a case, exercise great caution. Zanaflex may produce anaphylaxis. Signs and symptoms including respiratory depression, urticaria, and angioedema of the throat and tongue have been observed. Patients should be briefed about signs and symptoms of severe allergic reactions and instructed to discontinue Zanaflex and seek immediate medical care should these signs and symptoms take place. Withdrawal adverse reactions include elevated levels of blood pressure, tachycardia, and increased tone of muscles. To minimize the risk of these reactions, particularly in patients who have been taking high doses (20 to 28 mg daily) for long periods of time (9 weeks or more) or who may be on concomitant therapywith narcotics, the dose should be decreased slowly (2 to 4 mg per day). Zanaflex has been assigned pregnancy category C and should only be used when its medical benefits outweigh any harmful effects. Zanaflex tablets and capsules may be prescribed with or without food. Once the dosage has been selected and the decision to take with or without food has been made, this regimen should not be changed. Food has vastly complex effects on tizanidine pharmacokinetics, which vary with the different formulations. Zanaflex Capsules and Zanaflex tablets are bioequivalent to each other under fasting conditions (more than 3 hours after a meal), but not when administered after a meal (within 30 minutes of a meal). These pharmacokinetic variations may result in medically significant effects when switching administration of tablet and capsules and when switching administration between the fed or fasting state. These changes may result in increased adverse events, or delayed or more rapid onset of activity, depending upon the nature of the alteration in formulation. For this reason, the doctor should be thoroughly familiar with the changes in kinetics associated with these different conditions and prescribe accordingly. The suggested starting dose is 2 mg. Because the effect of Zanaflex manifests itself at approximately 1 to 2 hours after taking dose and diminish within 3 to 6 hours post-dose, treatment can be repeated at 6 to 8 hour intervals, as needed, to a maximum of three doses in a single day. Dosage can be steadily increased by 2 mg to 4 mg at each dose, with 1 to 4 days between dosage increases, until an adequate reduction of muscle tone is achieved. The total daily dose should not surpass 36 mg. Single doses greater than 16 mg have not been studied as of yet. 4 mg: White opaque body with blue opaque cap. 6 mg: Blue opaque body with a white stripe and blue opaque cap with "6 MG" embossed on the lid. 4 mg white, uncoated tablets. A history of prolonged QT syndrome. If you have any of these conditions, you may not be able to use Zanaflex or you may require a dosage adjustment or regular tests during treatment. This medication may be harmful to pregnant mother and fetus. Inform your doctor if you are pregnant or plan to become pregnant during treatment. It is not known whether tizanidine passes into breast milk or if it could harm an infant. Do not use this medication without telling your doctor if you are breast-feeding your baby. In elderly patients, Zanaflex may take much longer to clear from the body. Follow your doctor's instructions to the letter about your specific dosage and medication schedule. Take this medication exactly as it was prescribed for you. Do not take the medication dosage in larger amounts, or take it for longer than recommended by your doctor. Follow the directions on your prescription label. Your doctor may sporadically change your dose to make sure you get the best results from this medication and according to your clinical requirements. Tizanidine is a short-acting medication, and its effects will be most noticeable between 1 and 6 hours after administration of dosage. This medication should be used only for daily activities that require relief from muscle spasticity. In most cases, you may require up to three doses in one day if needed. Allow 6 to 8 hours intervals between doses. Carefully follow your doctor's instructions about taking this medication with or without food. Taking tizanidine tablets after meals can increase the levels of tizanidine in your blood stream, but taking tizanidine capsules after meals can decrease the levels and effect of medicine. Do not take more than three doses (36 mg) in within a single day or 24 hours. Too much of this medication can damage your liver and over dosage symptoms may appear. To be sure this medication is not causing harmful effects; your liver function and renal function will need to be tested on a regular basis. Do not miss any scheduled trips to your doctor. You may experience withdrawal symptoms including dizziness, fast heart rate, tremors, anxiety, and increased spasticity when you stop using Zanaflex after using it over a long period of time. Do not stop using this medication suddenly without first talking to your doctor. You may need gradually decrease dosage before you stop the medication completely to avoid withdrawal symptoms. Store Zanaflex at room temperature away from moisture and heat and away from reach of children. Soma is a muscle relaxant that relieves musculo skeletal pain. It is used in conjunction with physical therapy and rest to treat injuries of muscles (10, 11). Chief component of Soma is medical substance called Carisoprodol. Carisoprodol is a central nervous system depressant that acts as a sedative agent and skeletal muscle relaxant. Instead of acting directly on skeletal muscle, carisoprodol impedes neuronal communication within the reticular formation and spinal cord, resulting in sedation and alteration in pain perception. Its exact mechanism of action is not known yet. It primarily works by blocking pain sensations between nerves and brain (12). Nervous system side effects are most commonly encountered during Soma therapy including sedation and dizziness. Road accidents have been reported in association with use of Soma induced by carisoprodol . Dizziness, ataxia, insomnia, tremor, headache, agitation have been observed. The sedative effects of Soma and other central nervous system depressants for example alcohol, benzodiazepines, opioids, tricyclic antidepressants may be additive. Therefore, care should be taken with patients who take more than one of these central nervous system depressants together. Combined use of Soma and meprobamate, a metabolite of SOMA, is not recommended. Soma is metabolized in the liver by CYP2C19 to give meprobamate. Co-administration of CYP2C19 inhibitors, such as omeprazole or fluvoxamine, with Soma could result in increased exposure of carisoprodol and decreased exposure of meprobamate. Combined use of CYP2C19 inducers, such as rifampin or St. John's Wort, with Soma could result in decreased exposure of carisoprodol and increased exposure of meprobamate. Low dose aspirin also showed an induction effect on CYP2C19. This medicine can be addictive and habit-forming and should be used only by the person it was prescribed for. Soma should never be given to another person randomly, especially someone who has a history of drug abuse or addiction. Keep the medication in a secure place where others cannot reach it. You may have withdrawal symptoms when you stop using Soma after using it over a long period of time (14). Do not stop using this medication abruptly without first talking to your doctor. You may need to gradually decrease the dose before you stop the medication completely. Soma can cause side effects that may impair your thinking or reactions therefore be careful if you drive, operate heavy machinery or do anything that requires you to be awake and alert. Avoid drinking alcohol. It can increase drowsiness and dizziness brought about by Soma. SOMA induces sedation (in clinical trials, 13% to 17% of patients who received SOMA experienced sedation compared to 6% of patients who received placebo) and may disrupt the mental and physical faculties required for the performance of potentially dangerous tasks such as driving a motor vehicle or operating heavy machinery. There have been post-marketing reports of motor vehicle accidents linked with the use of Soma. Soma contains carisoprodol which is a Schedule IV controlled substance. Carisoprodol has been subject to abuse, misuse, and criminal diversion for non therapeutic use. Patients undergoing carisoprodol therapy are prone to developing drug abuse habit. Abuse of carisoprodol poses a risk of over dosage which may lead to death, central nervous system and respiratory depression, low blood pressure, seizures and other disorders. Patients at high risk of Soma abuse may include those with prolonged use of carisoprodol, with a history of drug abuse, or those who use Soma in combination with other habit forming drugs. Attendants and doctor should carefully monitor patient for signs of drug abuse. In many cases, the person who becomes addicted to habitual use of a drug like Soma may come to depend on the drug for more than just the physical symptoms. They may rely on the drug for the euphoria and happy giddy feeling they get. These feelings may enable them to ignore problems in life and develop escapist tendencies. It is easy for them to depend on this drug for relief and escape from responsibilities. Tolerance occurs when a patient's reaction to a specific dosage and concentration is progressively reduced in the absence of disease progression, requiring an increase in the dosage to maintain therapeutic effect. Physical dependence is characterized by withdrawal symptoms after sudden discontinuation or a considerable dose reduction of a drug. Both tolerance and physical dependence have been reported with the prolonged use of Soma. Reported withdrawal symptoms with Soma include insomnia, vomiting, abdominal cramps, headache, tremors, muscle twitching, anxiety, ataxia, hallucinations, and psychosis. Instruct patients taking large doses of Soma or those taking the drug for a prolonged time to not suddenly stop Soma therapy. Inform your doctor about your complete medical history and any medical conditions that you might be suffering from. Do not use this medication if you are allergic to carisoprodol or meprobamate (Equanil, Miltown). If you have any of these conditions, you may need adjustment of dosage and regular medical checkups and tests. Inform your doctor if you are pregnant or plan to become pregnant during Soma therapy. Only use medicine if medical advantages outweigh any potential harmful effects. Nursing mothers are usually advised against using it as its safety for infant during breast feeding has not been established. Take this medication exactly as it was prescribed by your doctor. Do not take the medication in larger amounts, or take it for longer than recommended by your doctor. Do not alter dose frequency. Follow the directions on your prescription label. Store carisoprodol at room temperature away from moisture and heat and from reach of children who might accidentally ingest it. Avoid missing doses. If you miss a dose, take the missed dose as soon as you remember. If it is almost time for your next dose, skip the missed dose and take the medicine at the next regularly scheduled time. Do not take extra medicine to make up the missed dose as it may result in overdosage. Discontinue use immediately and seek emergency medical attention if you think you have used too much of this medicine. Over dosage can be potentially fatal. Overdose symptoms may include shallow breathing, vision problems, fast heartbeat, confusion, hallucinations, psychosis, muscle stiffness, feeling light-headed, fainting, or seizure and convulsions. Carisoprodol can cause adverse effects that may disrupt your thinking or reactions. Be careful if you drive or do anything that requires you to be awake and alert especially driving. 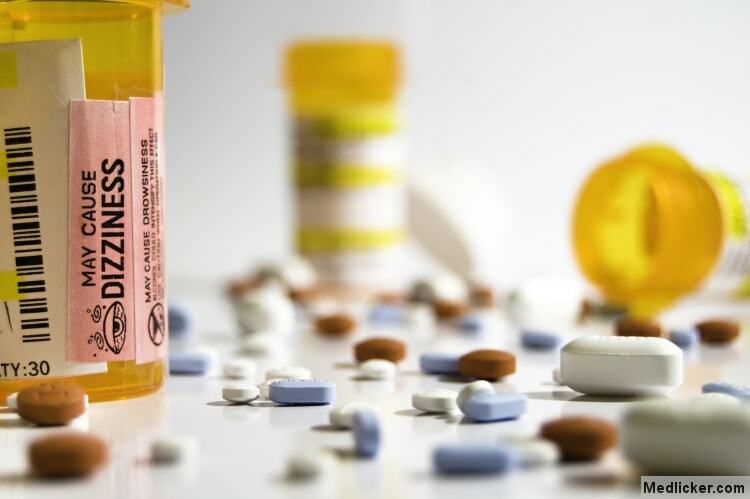 Cold or allergy medicine, narcotic pain medicine, sleeping pills, muscle relaxers, and medicine for seizures, depression or anxiety can add to sedative effect caused by carisoprodol. Inform your doctor if you regularly use any of these other medicines. Avoid drinking alcohol. It can increase drowsiness and dizziness caused by carisoprodol and exaggerates its adverse effects. There may be other drugs that can affect positive therapeutic capacity of carisoprodol. Tell your doctor about all the prescription and over-the-counter medicines you use. This includes vitamin supplements, minerals, herbal products, and drugs prescribed by other doctors. Do not start using a new medication without telling your doctor first. Flexeril is a muscle relaxer medicine used to provide relief from painful skeletal muscle spasms and associated pain in acute musculoskeletal conditions (15). Cyclobenzaprine in Flexeril does not directly act on the neuromuscular junction or the muscle but relieves muscle spasms through a central action, most probably at level of brain stem. Cyclobenzaprine attaches to serotonin receptor and is considered a 5-HT2 receptor antagonist that reduces muscle tone by decreasing the activity of descending serotonergic neurons. It primarily works by blocking transmission of pain sensation to brain (16). After sustaining an injury, muscle contractions may occur to stabilize the affected body part and prevent further damage. They also produce sensations of pain. Cyclobenzaprine is FDA-approved to provide relief and relaxation from such muscle spasms associated with acute, painful musculoskeletal conditions (17). It reduces pain in the first two weeks, peaking in the first few days, but has no proven benefit after two weeks beyond treatment of acute pain. Since no benefit is proven beyond that, therapy should be discontinued after two weeks. It is not useful in treating spasticity due to neurologic conditions such as cerebral palsy. Cyclobenzaprine is also useful in treating fibromyalgia. It is characterized by widespread muscle pain especially when pressure is applied. Elderly patients are particularly vulnerable to adverse effects of flexeril such as dizziness, confusion, fatigue and blurred vision. Nervous system side effects are common and include drowsiness and sedation. Cardiovascular side effects include cardiac arrhythmias, low blood pressure and tachycardia. Psychiatric side effects induced are mania, hallucinations and psychosis. In case of these manifestations, seek medical help at once. Allergic reaction to this drug appear in form of eruption of hives, respiratory depression, swelling of eyes, mouth and lips. Although rare, Flexeril over dosage may prove to be fatal. Intake of multiple drugs including alcohol ingestion is common in deliberate Flexeril overdose. Management of overdose is complex and tricky there it is recommended to contact a poison control center for immediate treatment. Signs and symptoms of toxicity may manifest rapidly after Flexeril overdose; therefore, hospital treatment and monitoring is required as soon as possible. The most frequently occuring effects associated with Flexeril overdose are sedation, drowsiness and tachycardia. Less common manifestations include tremors, agitation, coma, ataxia, elevated blood pressure, speech impairment, confusion, dizziness, nausea, vomiting, hallucinations and seizures or convulsions. Rarely occuring but potentially serious manifestations of overdose include cardiac failure, chest pain, cardiac dysrhythmias, severe hypotension, seizures, and neuroleptic malignant syndrome. Changes in the electrocardiogram, particularly in QRS axis or width, are clinically significant indicators of toxicity caused by flexeril overdose. In order to shield patient against the rare but possibly critical manifestations described above, take an ECG and immediately start cardiac monitoring. Protect the patient's airway, set up an intravenous line and begin stomach wash. Observation with cardiac monitoring and observation for signs of central nervous system or respiratory depression, hypotension, cardiac dysrhythmias and conduction blocks, and convulsions is crucial. If signs of toxicity by overdose appear at any time during this period, extended monitoring is compulsory. Monitoring of plasma drug levels should not guide treatment of the patient. Dialysis is probably not helpful in monitoring because of low plasma concentrations of the drug. Patients displaying signs of flexeril overdose toxicity should receive gastrointestinal decontamination. This process includes large volume gastric lavage followed by activated charcoal. If patient is unconscious, the airway should be secured before starting lavage and emesis is contraindicated. ECG and QRS- interval length determine severity of toxicity produced by flexeril overdose. Serum alkanization using intravenous sodium bicarbonate and hyperventilation should be carried out for patients with dysrhytmias or QRS prolongation. Dysrhytmias not responding to sodium bicarbonate therapy should be treated with lidocaine, bretylium or phenytoin. In patients with central nervous system depression, early intubation is recommended because of the possibility of rapid deterioration. Convulsions and seizures should be managed with benzodiazepines or, if these are unresponsive, other anticonvulsants such as phenobarbital, phenytoin should be used. Physostigmine is not recommended except in treat life-threatening conditions where other therapies have failed and then only in close consultation with a poison control center. Since ingestion of over dose is often deliberate, patients may attempt suicide by other means during the recovery phase. Psychiatric referral may be needed. The procedure of management of child and adult over dosages is same. It is strongly advised that the doctor contact the local poison control center for specific pediatric treatment. Flexeril has an action similar to atropine and should be used with care in patients with a history of urinary disturbance, angle-closure glaucoma, increased intraocular pressure, and in patients taking anticholinergic drugs (19). The plasma concentration of flexeril is increased in patients with hepatic disease. These liver patients are generally more v to drugs lnerablewith potentially sedative properties, including flexeril. Flexeril should be used with caution in patients with mild hepatic disturbance starting with a 5 mg dose and titrating slowly upward. The use of flexeril in moderate to severe hepatic impairment is not recommended. Do not take Flexeril together with an MAO inhibitor such as isocarboxazid (Marplan), tranylcypromine (Parnate), phenelzine (Nardil), or selegiline (Eldepryl, Emsam). Do not use these medication together unless a gap of two weeks has passed. Potentially fatal, life-threatening side effects can occur if you take flexeril before the MAO inhibitor has cleared from your body. Concomitant use of these medicines can increase the level of serotonin in your body. Dangerously high serotonin levels may cause variations in body temperature, blood pressure and behavior, leading to a medical condition called Serotonin Syndrome. Serotonin Syndrome can be life threatening. If you suffer from muscle tics, tremors, shivering or stiffness, fever, heavy sweating, heart palpitations, restlessness, confusion, agitation, trouble with coordination, or severe diarrhea contact your doctor right away. This list does not cover all drug interactions and there may be other drugs that can interact with flexeril. Therefore tell your doctor about all your prescription and over-the-counter medications, vitamins, minerals, herbal products, and drugs prescribed by other doctors. Do not begin a new medicine regime without consulting your doctor. The plasma concentration of flexeril is elevated in elderly patients. The elderly may also be more prone to risks for central nervous system adverse events such as hallucinations and confusion. For these reasons, in the elderly, flexeril should be used only if clearly needed. In such patients flexeril should be initiated with a 5 mg dose and titrated slowly upward. If you are suffering from any one of these conditions, your doctor will most probably adjust your dose and recommend regular medical tests. Flexeril, especially when used with alcohol or other nervous system depressants, may impair mental and physical faculties needed for performance of hazardous tasks, such as operating machinery or driving a motor vehicle. This drug may make you dizzy or drowsy. Do not drive, use machinery, or do any activity that require full alertness until you are sure you can perform such activities safely. Avoid use of alcoholic beverages. The dosage is based patient’s medical condition and response to therapy. This medication should only be used short-term (for 3 weeks or less) unless a longer duration is prescribed by your doctor. Do not increase your dose or use this drug more often or for longer than prescribed. Its therapeutic effects will cause more harm than good. Tell your doctor if your condition persists after two or three weeks of therapy or worsens. Before taking flexeril, tell your doctor or pharmacist if you are allergic to it; or if you have any other type of allergies. This medicine contains inactive components, which can provoke allergic reactions or other problems. Talk to your pharmacist for more details. Prior to use of this medication, inform in detail your doctor or pharmacist about your medical history, especially regarding hepatic disease, overactive thyroid (hyperthyroidism), heart problems (such as irregular heartbeat, heart block, heart failure, recent heart attack), problems in urinating (such as due to an enlarged prostate), glaucoma. Inform your doctor or dentist before any surgical procedure that you are using this medication to avoid any harmful consequences. During pregnancy, this medication should only be used when its benefits outweigh adverse harmful effects. It has been assigned pregnancy category B. Tell your doctor if you are pregnant or plan to become pregnant during course of therapy. It is unknown if this medication passes into breast milk. However, similar drugs pass into breast milk. Consult your doctor before breast-feeding as the medicine may have harmful implications for infants. Do not share this medication with others or give it to another person randomly. This medication has been prescribed for your current musculoskeletal problems only. Do not use it later for another condition unless your doctor prescribes it. A different medication or dose may be required in that case. Take medicine regularly. If you miss a dose, take it as soon as you remember. If it is near the time of the next dose, skip the missed dose and resume your usual dosing schedule. Do not double the dose to catch up as it might lead to over dosage. Do not flush medications down the toilet or pour them into a drain unless instructed to do so. Properly discard this product when it is expired or no longer needed. Consult your pharmacist or local waste disposal company about its disposal. All three of these drugs have the same role that is to relax muscles and provide relief from pain. But they should be used cautiously and according to your medical requirements. Core component of Zanaflex is tizanidine. Chief component of Soma is carisoprodol. Main component of flexeril is cyclobenzaprine. Zanaflex is used to treat muscle spasticity. Soma is a sedative medicine and a muscular relaxant. Flexeril is used to relax muscles and provide relief from associated pain. Patients using zanaflex are not at much risk to develop addiction to drug. Carisoprodol in Soma is highly addictive drug and is not recommended for use in patients with history of drug abuse. 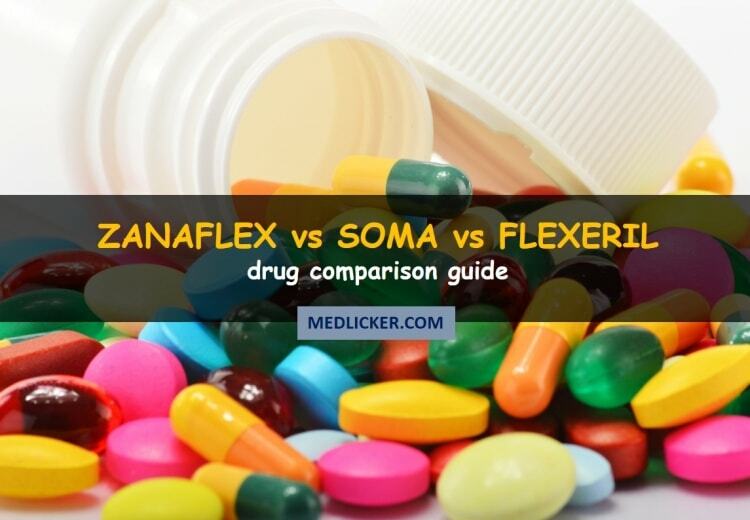 Flexeril is mildly habit forming but not as dangerous as Soma. Patients of hypotension, renal and liver disease should avoid using Zanaflex. Soma is contraindicated in patients suffering from epilepsy, renal or liver disease. Flexeril is not recommended for patients of urinary retention, heart disease and liver disease.